Meet Allen Zhang, the winner of our 2019 Carol Chatelain Young Artist Competition. At the age of 6, Allen began suzuki listening training at his elementary school in Lansdale, Pennsylvania. In 2013, at the age of 11, he began studying with Simon Gollo, current Assistant Professor in the Department of Music at New Mexico State University. In 2014, Allen moved to Manhattan, Kansas with his family. In the same year, he joined the Gold Orchestra directed by Dr. David Littrell, University Distinguished Professor of Music at Kansas State University. Allen participated in the 2015 Midwest Music Camp at the University of Kansas, in which he won the Outstanding Overall String Musician Award and a full scholarship for the subsequent year. He attended the 2016 Nuevo Mundo Festival & Academy in Oranjestad, Aruba, studying under internationally acclaimed musicians Dmitri Berlinsky and Richard Young. Allen was chosen as the state representative at the West Central Division for the 2017 MTNA Junior Strings Competition and the 2018 and 2019 MTNA Senior Strings Competitions. 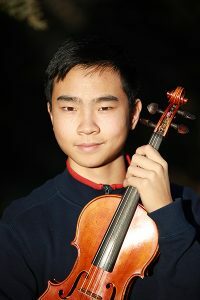 Allen was a finalist in the 2017 Kansas City Symphony Young Artist Competition and was the winner of the 2017 Midwest Chamber Ensemble Youth Concerto Competition, performing the third movement of the Bruch Violin Concerto in G minor. In the summer of 2017, he studied under James Buswell at the 2017 Vianden International Music Festival and School through a grant from the Koch Cultural Trust. He was also selected to the 2017 Esterhazy String Quartet Seminar under full tuition scholarship. Allen was also awarded third place in the 2017 International ENKOR Competition. Allen was selected as the concertmaster for the 2018 Kansas All-State Orchestra. After receiving Overall Winner and Strings Division Winner of the Topeka Young Artist Competition, Allen performed the first movement of the Mendelssohn Violin Concerto in E minor with the Topeka Symphony Orchestra. He also performed with the Fairbanks Symphony Orchestra while attending the 2018 Brian Lewis Young Artists Program, studying under Brian Lewis, Sean Riley, and Simon James. Selected as principal second for Carnegie Hall’s 2018 NYO2 orchestra, Allen studied with accomplished orchestral violinists Alex Kerr and Amy Oshiro-Morales as well as conductor Carlos Miguel Prieto. Allen currently studies with David Colwell, Assistant Professor of Violin at the University of Kansas, and Ben Sayevich at Park International Center for Music. Allen will be performing with KCCO at our Celebrating 60 Years! concert at Helzberg Hall on May 4th.